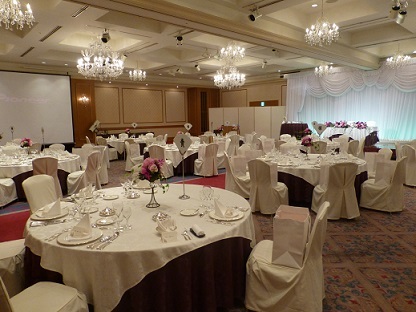 Of the visitor who was made a banquet after a wedding in a Hotel in Heian-Jingu Shrine yesterday .I went for support. Day when it was fine well so as to sweat a little and yesterday when I was. When they want you to take a lot of photographs wanting quests to please. 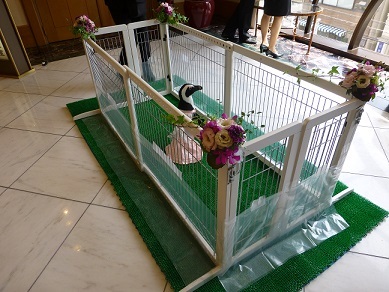 Penguin came from an aquarium of Shizuoka of the workplace. It is aid, the penguin “stay with the same mate for life “and is it seems to be a very lucky animal. Guests came to the lovely figure very with pleasure. In addition, there is a lot of surprise of friend in the banquet; it was time for large serving rise. It became the banquet given the smile of all of you only by bridal couple. I pray for the happiness of two people heartily from Kyoto.